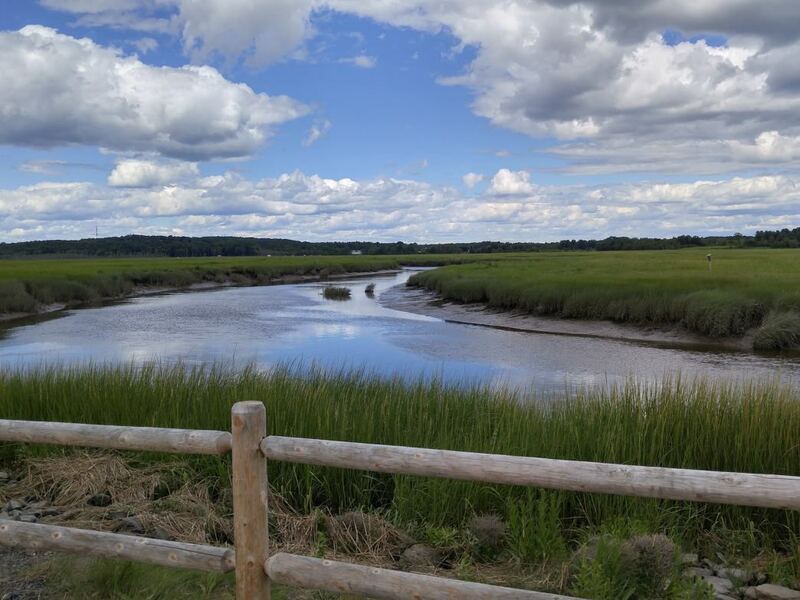 Scarborough Marsh is Maine's largest salt marsh. This bridge marks the turnaround point for about an hour and a half of kayaking. Kayaking the marsh is a good place to go with a friend or two. 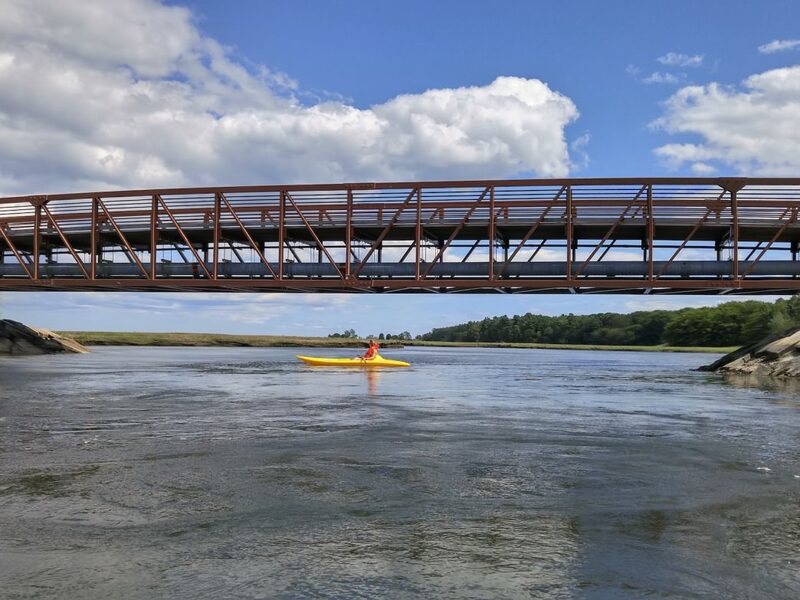 Paddle along Maine's largest salt marsh and explore the 3,100 acre estuary known as the Scarborough Marsh. The tides play an important role in the flow of the water, making it more difficult to paddle a certain direction depending on the tide. You can take as short or long as you want, as long as you are back by 5, but an hour and a half is plenty to see a good chunk of the marsh. The Audubon Center is only open late spring through early fall. To protect the wildlife, dogs are not permitted. If you want to rent a canoe or kayak, it is $14 per hour for members and $16 per hour for non-members. The Scarborough Marsh is the largest salt marsh in the state of Maine. The 3,100 acre estuary contains tidal marsh, salt creeks, freshwater marsh and uplands, and is important for local animals as breeding and feeding grounds. 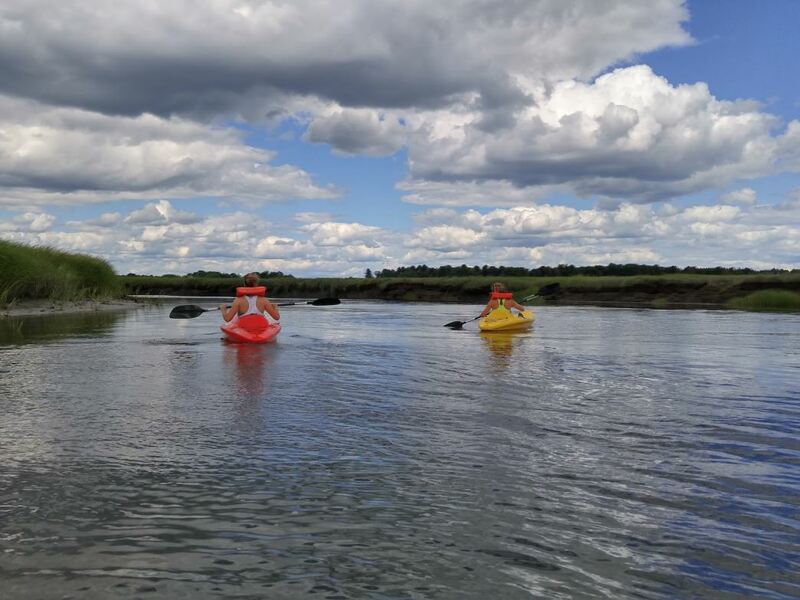 The Dunstan River that twists through the Scarborough Marsh is an excellent place to canoe or kayak while exploring and observing the wildlife in the estuary. The tides play an important role in the distribution of water throughout the marsh, and significant changes in water levels and the flow of the water can be observed in just a couple hours. You may find yourself paddling against the tide or with it depending on when you visit the marsh. The Maine Audubon has a center located on the Scarborough Marsh. It is at this center that you may begin your exploration of the marsh with canoes or kayaks. You are allowed to bring your own canoes and kayaks, but if you do not have any, the center provides equipment available to rent. You will have to sign a waiver, and children 14 and under will have to ride in a canoe with an adult or in a tandem kayak. Guided tours are also available. If you are interested in learning more about the wildlife of the Scarborough Marsh, the Audubon Center contains a small discovery room with various information about the flora and fauna you may encounter during your visit here. Learning about the salt marsh before you paddle the waters will help you better appreciate the impact these regions have on the surrounding ecosystems. Many act as the foundations for food chains that extend far beyond just the salt marsh. Families especially will enjoy their time paddling around the Scarborough Marsh. Kids will be fascinated by the materials located in the discovery room at the Audubon Center, and they will be excited to try to apply some of what they learned as you paddle along the Dunstan River. If you are looking for some peace and quiet, a few hours kayaking here are all you need to escape and relax. You will most likely not have the entire place to yourself, but you can easily distance yourself from other groups on the river. It is also a great place to explore with a few friends for the day. The Scarborough Marsh is located just south of Portland in Scarborough. Take Route 1 down to Scarborough and turn left onto Route 9. The Audubon Center is located just under a mile on your left. Whether you are bringing your own kayaks and canoes or renting some, the center is where you will put in to the Scarborough Marsh. If you are renting kayaks or canoes, they cost $14 an hour for Audubon members and $16 an hour for nonmembers. A map of the marsh and life jackets are provided with the rentals. Dogs are not allowed in order to protect the wildlife of the marsh. Alcohol, fires, and firearms are are prohibited as well. The Audubon Center is open daily June through Labor Day from 9:30 a.m. to 5:30 p.m. and weekends Memorial Day through September.